The tube of cheese in question. 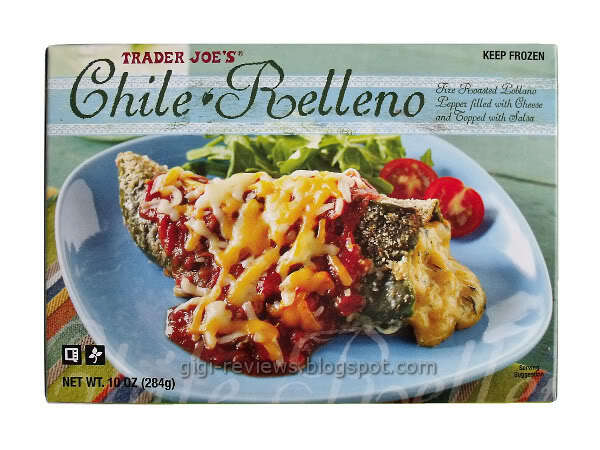 Once again, I am shocked that Trader Joe’s Chile Rellano is not on the Trader Jose label. What’s the point of positing the existence of a Hispanic doppelganger if you’re not going to ham-handedly slap him on all your Spanish-inspired cuisine? For that matter, why have a Trader Jose, a Trader Giotto, a Trader Josef and so on, but not a Korean Trader Jae, an Egyptian Trader Jahi, or a Thai Trader Jayavarman? Why the narrow window of ethno-specificity Trader Joe’s? Edward Said called, he wants to know where you got your Orientalism. As you can see, chile rellanos don’t even crack the top 5, so TJ’s was already embarking on an uphill battle when they created this product then let me go home with it. Strike 1 and 2, Trader Joe’s. Dubious but willing, I tucked in. The Trader Joe’s Chile Rellano is a roasted poblano pepper, nice and mild, stuffed with monterey jack, slathered in spicy tomato salsa, dusted with bread crumbs and topped with cheddar. When that much melted cheese comes into play, it’s hard to make an unpalatable dish – and as you might imagine these rellanos go down easy. While most rellanos contain meat of some sort, take note that this one is a vegetarian dish, meaning it is little more than a meat-free, tube of cheese. This is not necessarily a bad thing, especially if you’re a vegetarian looking for sustenance amid the barrens of the modern grocery store. If you’re looking for that meat free Mexican food fix, here you are. The salsa is admirably spicy, delivering a short sharp burn with each bite, and the roasted pepper is toothsome, if somewhat tough to cut. The vegetarian rellano also boosts a surprisingly high protein profile, 22 grams to the serving, which might give you some sense of how much cheese we’re talking about here. For my part, I found the meat-less rellano less than filling. As a component to a larger Mexican dish it would certainly be more effective – as plate compatriot to an enchilada, perhaps, or a taco. 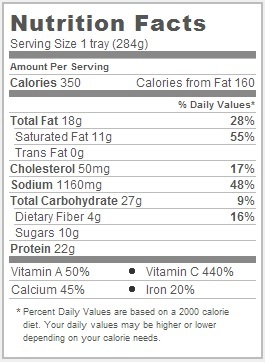 However, if I’m going to ingest that much straight up cheese I have other ways I’d prefer to go about it. (See table 1-1). Would I Recommend It: To Mexican craving vegetarians, no one else. Would I buy it again: I don’t see it happening. Final Synopsis: This cheesy pepper is alright, but nothing special. I’ve eaten a lot of rellenos, and none of them had any meat. That said, TJ’s rellenos, which appear to be the same as Amy’s, are not very good. They are unskinned, so tough, and sacrifice a lot of flavor to stay healthy.